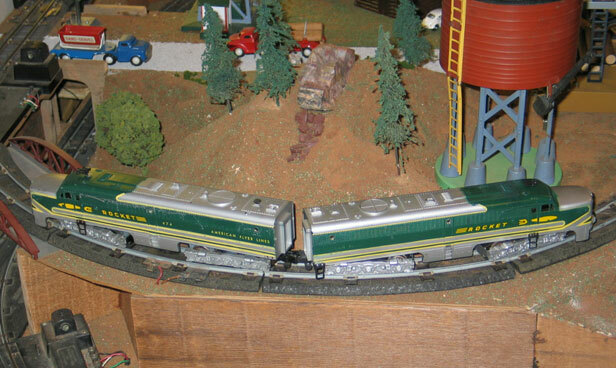 I started this set in 2004 with the acquisition of two vista dome cars and the observation car. In 2005, I added the two Alco diesel engines and Jefferson Coach. The Columbus Combo and a third dome car followed in 2006. These green-stripe cars were made in 1954 and 1955. Here's my complete train on the red line of the lower loop. 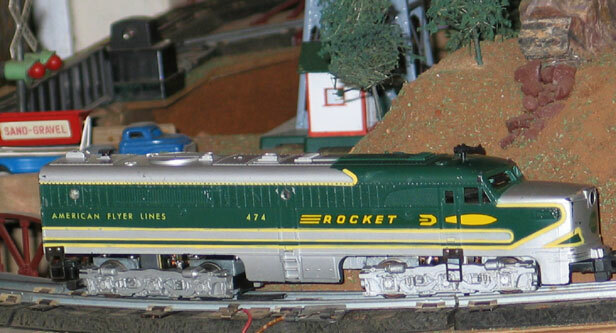 In 1954 the Rocket was sold as set #K5364W with three #962 dome cars and a #963 observation car. That same train was sold in 1955 as set #110. It was sold as set #2H346 in both 1954 and 1955. 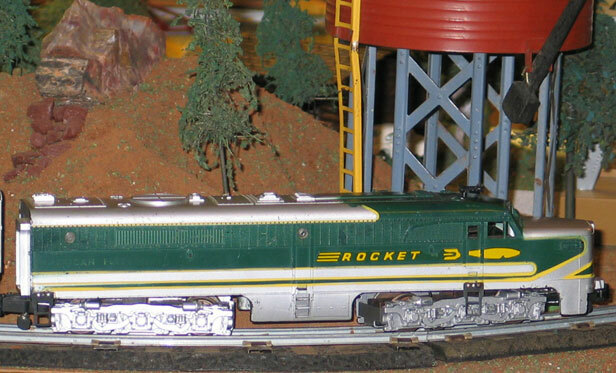 In 1955 the Rocket was sold as set #5570H with the four different green-stripe cars. It was also part of the #351 Dealer Display set in 1955. Unsold inventory was sold as uncatalogued sets #20003 and #20270 in 1957. I assembled a 4745 Alco engine set the same way I did the Santa Fe Chief. I bought a batch of chasses and found a 475 shell to put on one of the dummy chasses. I put on sideframes with couplers and a new set of horns. Some new decals and an air vent will restore it to Very Good condition. Here's the powered 474 engine that I bought to finish the set. And here's the completed engine set. My first #962 Hamilton vista dome car. My second #962 Hamilton vista dome car. I had to get a third dome car to complete the set.